"As a child I loved this poem written by Gelett Burgess, an artist, art critic, poet, author and humorist. The short nonsense poem was initially published in the first issue of his magazine The Lark in May 1895 and became his most widely known work. 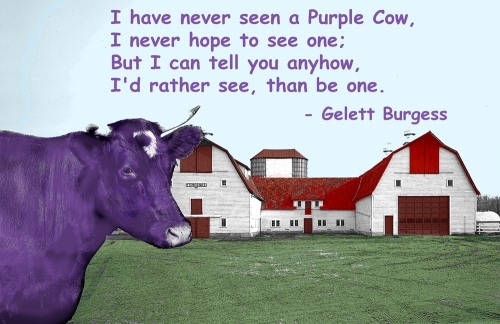 Utilizing the poem in our Americana series, the background is comprised of a vintage black and white photo of a barn, and another old image of a cow. Both were restored and colorized and the poem added to create a one of kind composition".